Famous for delicious local plaice and located close to the productive fishing waters of Start Bay and the English Channel, it’s not surprising that restaurants in Dartmouth are a great place to enjoy freshly-sourced seafood. Yet, while there’s no shortage of seafood options for all occasions and budgets, Dartmouth eateries aren’t limited to the fruits of the sea. In no particular order, let’s look at our top 10 restaurants in Dartmouth, as chosen by our local team. 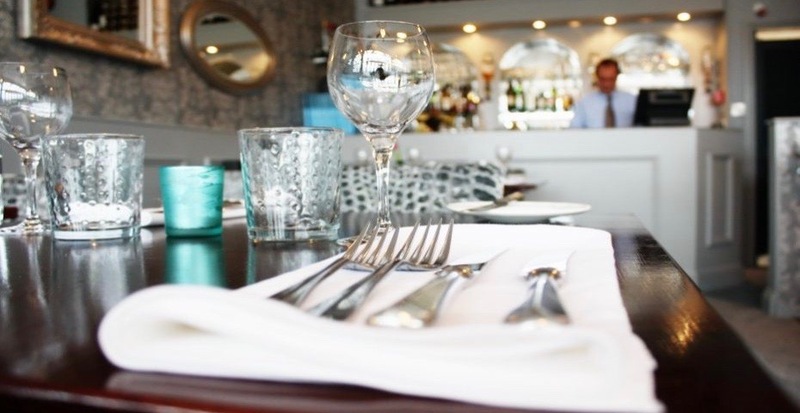 The multi-award-winning Seahorse, run by celebrity chef Mitch Tonks with his business partner Matt Prowse, must be the most famous of all restaurants in Dartmouth. The sensational seasonal fish menu changes daily, but usually includes sea bass, monkfish, and heavenly scallops. Many of the dishes are cooked over the charcoal fire in the restaurant, making for simple but beautifully prepared meals. After your meal, we highly suggest that you continue your evening in the wine bar annex. The super-sophisticated Joe’s Bar is featured in our blog post, ‘3 stylish Dartmouth wine bars’. South Devon is one of the most beautiful areas in the country. Every time I go away on holiday I love it, but I can’t wait to get back. You may have seen Mitch on TV shows such as Channel 4’s Sunday Brunch or his television series, ‘Mitch and Matt’s Big Fish’ on UKTV Food, amongst other shows. Booking at the Seahorse is essential, which you can do at: www.seahorserestaurant.co.uk. Kendrick’s is a casual restaurant with a tasty ‘Tex-Mex’ themed menu and a friendly, lively atmosphere. Even in this holiday destination’s quieter months, Kendrick’s is often very much alive with groups of work colleagues, officer cadets, families and couples all making the most of the restaurant’s reasonable prices and flavoursome fare. Hearty classics like steaks, burgers, ribs and grills form the meat of the menu, along with some chilli options and the ever-popular sizzling fajitas. Don’t forget to check out the specials board too, which changes regularly with the seasons. Early bird offers and other deals are fairly common, so click here to view their website for updates. Many small towns have just one fish and chip shop, while in others there could be a handful but in most cases locals usually reach a consensus of which is the best. Dartmouth is unusual in that its two most frequented ‘chippies’ are similarly popular both with visitors and longtime residents. We recommend giving both a try on your break. With a 4.2 Google Reviews score and a 4.5 TripAdvisor rating (with 648 reviews) there’s no doubting the quality on offer at the Wheelhouse, an old-fashioned fish and chip shop and restaurant. The menu, whether that’s to take away or eat in, is surprisingly varied, with sandwiches, chicken dishes, burgers and salads all on the menu. But it’s for classic fish and chips that the Wheelhouse has built its excellent reputation. 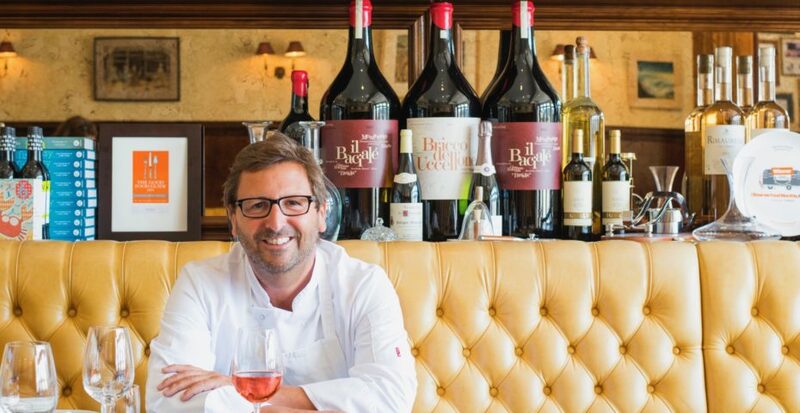 Like the Seahorse restaurant, Rockfish is owned and managed by celebrity chef Mitch Tonks. 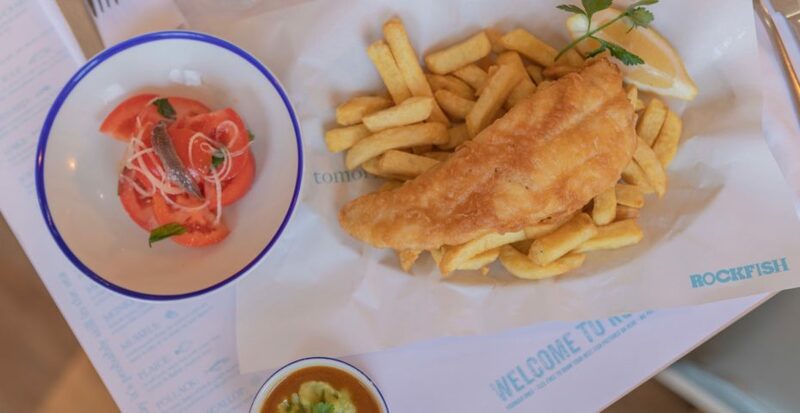 Part of a small Devon chain of six fish restaurants, it’s a stylishly rustic eatery by the water – the perfect setting for a portion of fish and chips. This delicious seafood establishment gets top marks from us, not only for its mouth-watering dishes but for its ability to create everything on the menu gluten free! There are lots of other interesting food options too. So if you’ve already indulged in enough battered cod for a little while, you’ll be happy to know the menu contains such enticing dishes as roasted scallops, mussels in wine and garlic, tempura vegetables, halloumi burgers and plenty more. Their motto, ‘Tomorrow’s fish are still in the sea’, sums up their approach to sourcing fresh produce from the local area. They also host live music on selected Wednesdays. These Rockfish Sessions create a phenomenal atmosphere not just filled with acoustic notes, but the sound of laughter, a jolly cheers and the warm welcome to each and every loyal customer. Owned by the Head Chef, Shahar Lashkor, in 2008 the Spice Bazaar was voted the best South Asian restaurant in the South West. This tucked away restaurant, which you’ll find opposite St Saviour’s Church in Church Close, is very easy to pass by without noticing. But once you’ve found it, like many residents and regular visitors, you’ll be sure to want to return many times over. The large menu includes some delicious vegetarian options as well as all the meat and fish dishes you’d expect. If you think you’ll be heading there regularly, why not join the Spice Bazaar Dining Club, and make the most of discounts up to 20% as well as other bonuses? An elegantly-styled restaurant with stunning views across the Dart to Kingswear, Taylor’s has been run by Peter and Pauline for 20 years. Highly rated by foodies, both online and through word of mouth, this intimate first-floor restaurant has a select menu which is mainly focused on fish. There are also some vegetable and meat dishes to choose from based on classic flavour combinations, and why not finish with a homemade dessert? Click here to read the menu: www.taylorsrestaurant.co.uk/menu. The cosmopolitan Anzac Street Bistro combines Mediterranean cuisine with a Polish twist alongside Devon-sourced ingredients to create a unique restaurant. The menu changes with the seasons, not simply to reflect the availability of fresh produce but also how our tastes reflect the time of year. There’s an emphasis on seafood but plenty of other options too. Owners Simon and Aga, along with Head Chef Rafal, are also happy to accommodate diners with specific dietary requirements. This makes them a popular choice for vegans and vegetarians, as well as those with allergies or intolerances. There’s live music at the Anzac Street Bistro on most Saturdays and some Sundays, which tends to be mellow piano or acoustic sets with other performances arranged for the town’s annual events and festivals. 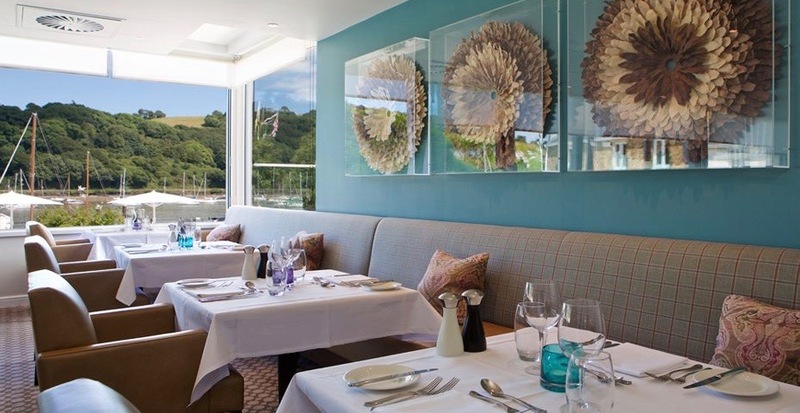 For the ultimate foodie explorer in us all, The Angel is a luxury waterside restaurant, facing the River Dart – a must-visit in order to complete your gastronomic adventure in Dartmouth. With an expertly crafted seasonal menu, each course, bite, sip and scoop celebrates Devon’s fantastic larder through wonderfully simplistic, delicate dishes… think pieces of artwork on a plate! Head Chef Elly Wentworth has not only excited our taste buds with her bold yet unpretentious cooking, but she came to fame after her appearance on BBC’s MasterChef The Professionals in 2016, where she left the competition as a successful runner up. More recently, Elly has returned to the MasterChef kitchen in 2018 for ‘The Professionals: Rematch’, where we watched Monica Galetti visit The Angel restaurant and indulge in mouth-watering food. Serving hearty meat based dishes such as Ruby Red beef and Dartmoor Shepherd lamp, as well as lighter courses that feature line caught seabass and delicious braised halibut, if it’s good enough for celebrity chefs, it’s good enough for us! 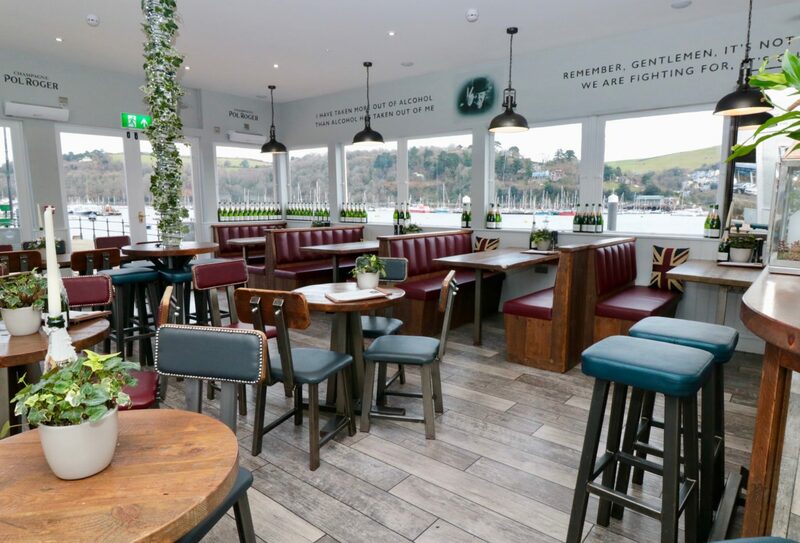 If it’s elegant fine dining and a relaxing ambiance that you’re looking for, The River Restaurant at Dart Marina is the place for you. Whether you’re hoping for something light and flavoursome after a relaxing morning in the Dart Marina Health Spa, or you’re wishing to try famous Bigbury Bay oysters whilst in South Devon, or your belly is rumbling for an exquisite desert, their menu has something to suit all taste buds. Download the River Restaurant menu and wine list here: www.dartmarina.com/River-restaurant. In the heart of Dartmouth you’ll find this delightful, recently renovated champagne bar and restaurant. 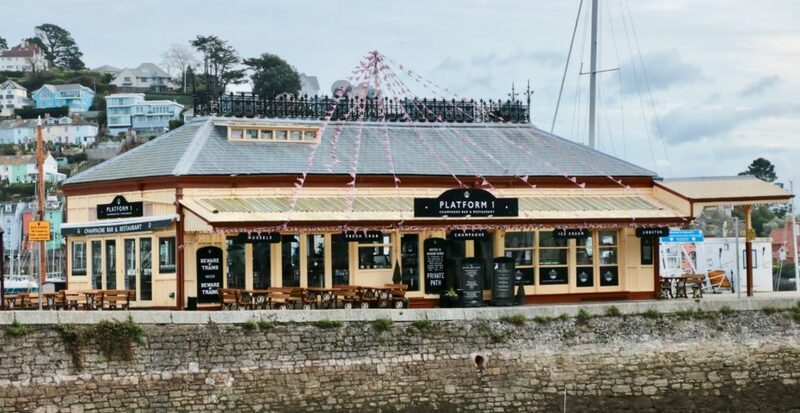 Known as ‘Platform 1’ to locals, this popular spot caught our eye at Dartmouth Regatta in 2018, which appeared to be one of the most prevalent spots around! People flooded in to pop fizz, crack open a lobster, laugh amongst friends and chatter the day away. This sociable establishment is one that’s a perfect place to gather loved ones together whilst on your South Devon break! For even more recommendations, take a look at our article on the best seafood restaurants in Devon, which includes dining experiences both on and off the water! Or, if you’ve stocked up on so much seafood on your break to Dartmouth, read our blog: Seven delightful Devon pub walks for just some of our team’s favourite places to indulge in a hearty Sunday feast!